Washington DC. Six Indians received prestigious Award of Excellence for their extra ordinary achievements in different Categories. in Chantilly, Virginia from US Senator Timothy Kaine and Congressman Gerald Connolly. 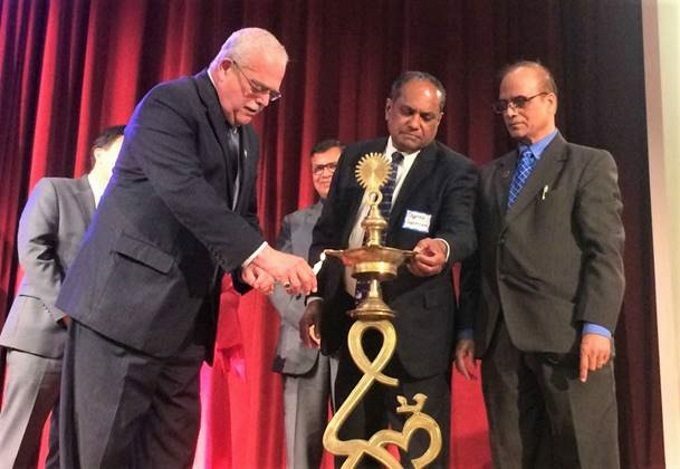 The program was organized by the Virginia Chapter of Global Organization of People of Indian Origin in Chantilly, Virginia at Chinmaya Somnath Auditorium. More than 200 people were present at the Awards Dinner. The awardees are selected by selection committee based on merits from 14 nominees. Among them are Ravi Chaudhary who is the Director of Commercial space and Federal Aviation and a former Lt. Colonial in Airforce is awarded in Science and Technology category. Professor Dr. Prashant Bhardwaj was given award in the field of Education, Dr. Rajesh Mehra a 25-year veteran Physician was awarded in Medicine, Dr. Ram Reddy in Entrepreneurship, Jay Mandal in Photo Journalism and Swati Sharma for Arts and Culture. US Senator Tim Kaine, who also the former Democratic Vice President candidate was the Chief guest along with Congressman Gerry Connolly as special Guest and Community Affair Minister Anurag Kumar presided on behalf of Ambassador of India Navtej Sarna as he could not make it due to out of Country. Virginia Legislative House Delegates Mark Keam and Jennifer Boysko were also present along with GOPIO International Chairman Dr. Thomas Abraham and prominent Indian and American community leaders. The program began with National Anthem of India and USA by Anjali Taneja. Followed by Ganesh Vandana by Mrs. Sumangala Bhandari. President of GOPIO Virginia delivered the welcome speech and spoke in GOPIO Vision, mission and work done by GOPIO Virginia as well as GOPIO International work. GOPIO International Chairman who specially came from New York also spoke on this occasion and talked about GOPIO achievements in last 29 years. Senator Tim Kaine and Congressman Garry Connoly congratulate the awardees and mentioned the contributions of Indians in the economic, educational and technology progress of US. They also mentioned the growing relationship between India and USA especially strategic, Military and Educational. There was a very special cultural program which includes performances of very famous and talented artists including classical and folk dances and classical songs. The audience like the classical singing by Swati Sharma accompanied by Nabil Riaz a well-known National Tabla player and Humayu on Harmonium. Program was emcee by Shweta Jain Vote of thanks was given by Sumit Kumar Program ended with delicious Indian Vegetarian food.